DAYTON — The federal government punished Allegiant Air this week for failing to provide passengers comfortable cabin temperatures on 10 delayed flights, including a summer 2017 flight out of Dayton. The U.S. Department of Transportation fined the low-fare airline $250,000 and ordered it to cease and desist from future similar violations. Federal regulations require airlines to provide comfortable cabin temperatures to passengers during tarmac delays. The government cited Allegiant Flight 1127 from James M. Cox Dayton International Airport on July 19, 2017 as one of the flights for which the airline failed to provide comfortable temperatures during a delay. On that day, the airport recorded a high temperature of 88 degrees, according to the National Weather Service. The government’s order does not reveal how hot airplane temperatures became, nor how cool the plane should have been kept. 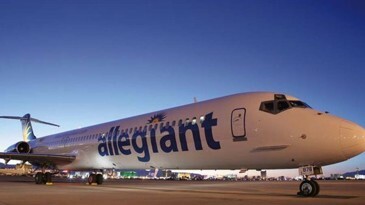 Allegiant told the government “it takes compliance with laws and regulations very seriously,” but added, “outdoor temperatures made cabin cooling during the tarmac delays difficult at best despite Allegiant’s use of air conditioning carts, ground power units, and other measures to supplement internally-generated cooling” on the flights. The government considers an airline’s failure to comply with regulations as an “unfair and deceptive practice” under the law. A tarmac delay occurs when an airplane on the ground is either awaiting takeoff or has just landed and passengers do not have the opportunity to get off the plane, according to the transportation department. For flights departing from a U.S. airport, airlines are required to begin to move the airplane to a location where passengers can safely get off within 3 hours for domestic flights and 4 hours for international flights, according to the department. During a tarmac delay, airlines must provide passengers with a snack, such as a granola bar, and drinking water no later than two hours after the aircraft leaves the gate, according to the department. The incident in Dayton is not the first for the airline. An engine on an Allegiant plane destined for Dayton caught fire in March 2017. The flight was one of 11 to suffer similar mechanical issues with the plane’s generator, according to a report from the National Transportation Safety Board. No injuries were reported for any of the 157 passengers or 6 crew members. Here we have the big airlines ganging up on the little moneymaker again. Every airline has cooling issues when it’s hot outside. It is hard to give Allegiant the benefit of the doubt, they have the most late and cancelled flights, and the worst customer service in the industry. I hate flying them, they make you feel like cattle.